Held every two years, the Convention on Biological Diversity is an international treaty for the conservation of biodiversity, the sustainable use of the components of biodiversity, and the equitable sharing of the benefits derived from the use of genetic resources. With 196 Parties, the convention has near universal participation among countries. Seeking to address all threats to biodiversity and ecosystem services — including threats from climate change — the convention employs scientific assessments, develops new tools, incentives and processes, and promotes the transfer of technologies and good practices. To comprehensively address threats to biodiversity, the convention engages various stakeholders including indigenous and local communities, youth, NGOs, and women, as well as the business community. Africa’s youth population is the largest in the world, and by 2050, the number of people between 0-24 years is projected to double. Increasing demand for resources is staggering an already vulnerable demographic, marginalized by political instability, food shortages, limited access to education, and extreme weather conditions. For the continent’s rich biodiversity, human population growth increases risks to threatened species and puts more pressure on ecosystems that provide essential goods and services for a vibrant economy. 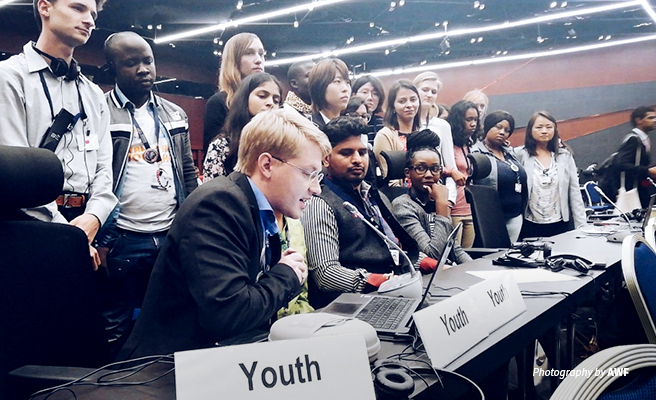 At the 14th Conference of Parties to the Convention in Sharm El-Sheikh, Egypt held in Nov. 2018, the African chapter of the Global Youth Biodiversity Network advocated for the inclusion of young people across the continent into the political processes of the convention, bringing their unique insight and skills into focus while also highlighting the challenges they face. The delegation presented the youth position at the African Ministerial Summit, which was held prior to the main global conference, urging governments to accelerate the implementation of Africa’s biodiversity conservation commitments and ensure that the process is synergistic and inclusive. The delegation reminded the ministers that sustainable development strategies must invest in marginalized groups — youth, children, women, indigenous people, and local communities — and recognize their innovative contributions in solving socioeconomic challenges and environmental issues. As the officially recognized group for youth in the negotiations under the convention, the Global Youth Biodiversity Network is instrumental in sensitizing decision-makers on the value of youth-led activities for conservation. As of August 2018, the Global Youth Biodiversity Network represents 115 member organizations, a total of 342,000 members from 107 countries worldwide. Ahead of the negotiations in Egypt, 50 young Africans from 17 countries attended an intensive five-day workshop hosted by African Wildlife Foundation in Nairobi, Kenya. Apart from the Global Youth Biodiversity Network’s steering committee and country chapters, the workshop drew representatives from youth advocacy groups, conservation organizations, and research institutions. AWF facilitated in-depth discussions on young people’s role in Africa's socioeconomic development and also provided expertise on resource mobilization and external funding for youth-led programs, lobbying for change, and advocacy campaigns. Such capacity building workshops are a critical tenet of the Global Youth Biodiversity Network’s mandate to increase general awareness and mobilize youth voices for conservation and sustainable development. In its closing statement at the U.N. Biodiversity Conference in Egypt, the youth network held that with greater ambition and political will, the 196 parties signed to the convention can implement the current strategic plan and meet targets ahead of the next conference to be held in Beijing in 2020. COP 15 will mark the beginning of a new global framework and a 10-year strategic plan. At this stage in the history of the convention, the Global Youth Biodiversity Network believes that promoting the rights of indigenous people and leveraging the knowledge of local communities is critical. Monipher Musasa is a Conservation Management Associate at African Wildlife Foundation and leads AWF’s engagement in the Convention on Biological Diversity, providing policy direction, and support to African governments in the convention. Monipher is one of the champions of the African Leadership Group on mainstreaming biodiversity and development and is very passionate about communicating the business case for biodiversity to non-conservationists. She holds an M.Phil in Conservation Leadership from the University of Cambridge.